Water Resources Center, University of Arkansas Division of Agriculture, Fayetteville, USA. 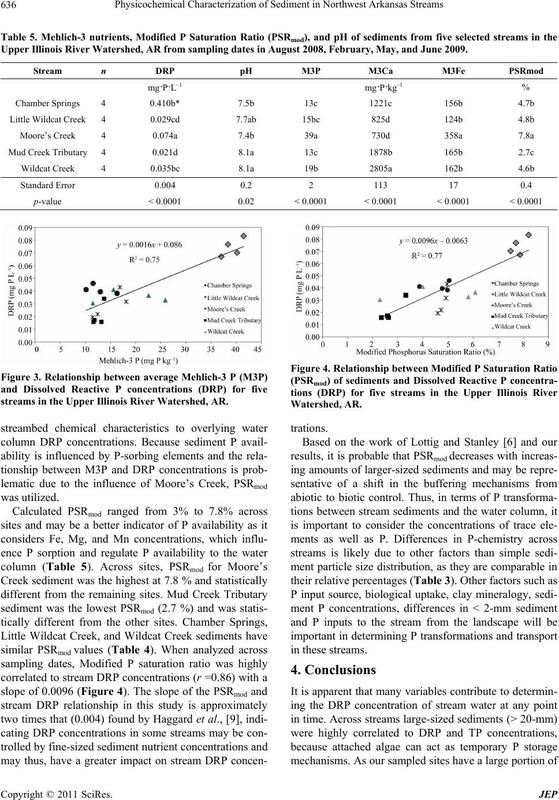 Received March 29th, 2011; revised May 2nd, 2011; accepted June 10th, 2011.
trient concentrations appear to be key regulators of water column P concentrations. concentrations of M3P and P sorbing elements [8,9]. further investigation to determine its applicability. surface runoff and groundwater leaching . nutrients. Each size fraction of sediment was air dried. the August, 2008 sample date. 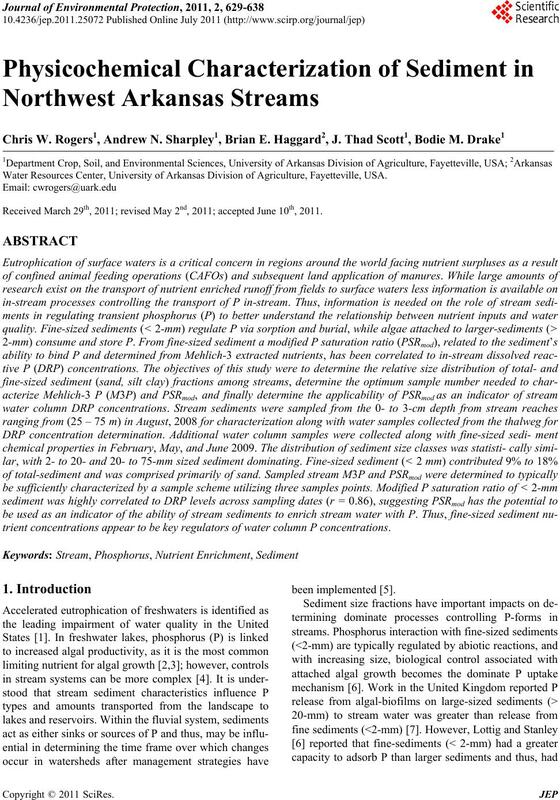 uary, May, and June 2009.
potential for soil P release to runoff [24,25]. In Sims et al. [M3P / M3Fe + M3Mg + M3Mn] for calcareous str eams. (r = 0.71) than M3P alone (r = 0.50) in Haggard et al. .
efficients of determination (R2) are reported. ing Fisher’s protected least significant difference (LSD). dence interval contained the “true” mean was calculated. individual transects from each site. Fisher’s protected least significant difference (LSD). 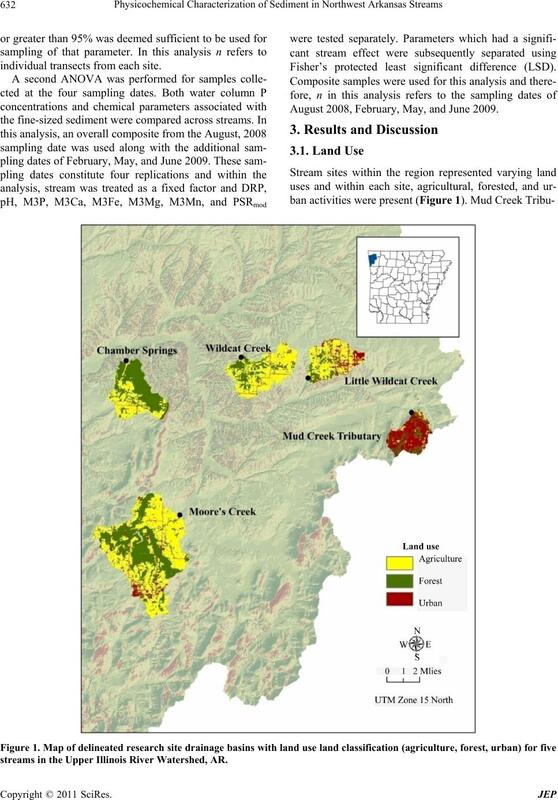 August 2008, February, May, and June 2009.
streams in the Upper Illinois River Watershed, AR. use and only 7% composed of agricultural land (Table 1). Upper Illinois River Watershed, AR. concentrations of 3.0 and 2.3 mg·m–2, respectively . tions which are abio tically driven (< 20-mm). 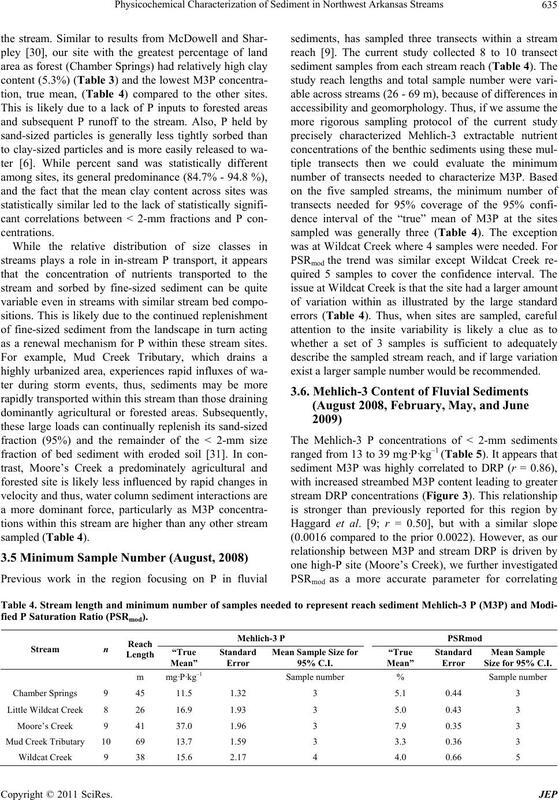 ranging from 0.3% to 10.8% of bed sediment (Table 3). Fisher’s Prote cted LSD (Table 3). Watershed, AR in August, 2008.
source of P to overlying waters . ent in the < 2-mm size class fractions (sand, silt, clay). events than Wildcat Creek or C hamber Springs. but within sites ranged from 2.1% to 5.4% (Table 3). tion, true mean, (Table 4) compared to the other sites. as a renewal mechanism for P within these stream sites. exist a larger sample number would be recommended. 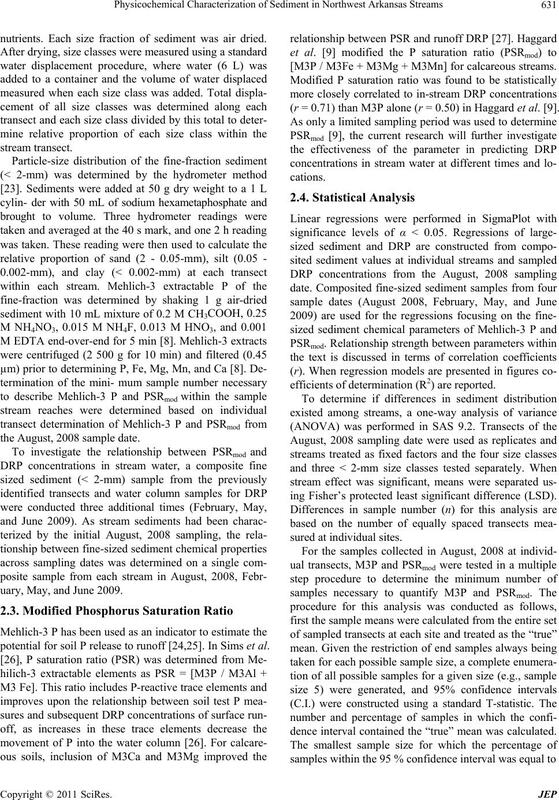 fied P Saturation Ratio (PSRmod). Upper Illinois River Watershed, AR from sampling dates in August 2008, February, May, and June 2009.
growth is likely a key regulator of DRP concentration. sources such as CAFOs are of importance. for his help in experiment design and data analysis. Center through a USGS 104-B grant. United States of America, Vol. 105, No. 49, 2008, p.
 D. Schindler, R. Hecky, D. Findlay, M. Stainton, B.
Sciences of the United States of America, Vol. 105, No. 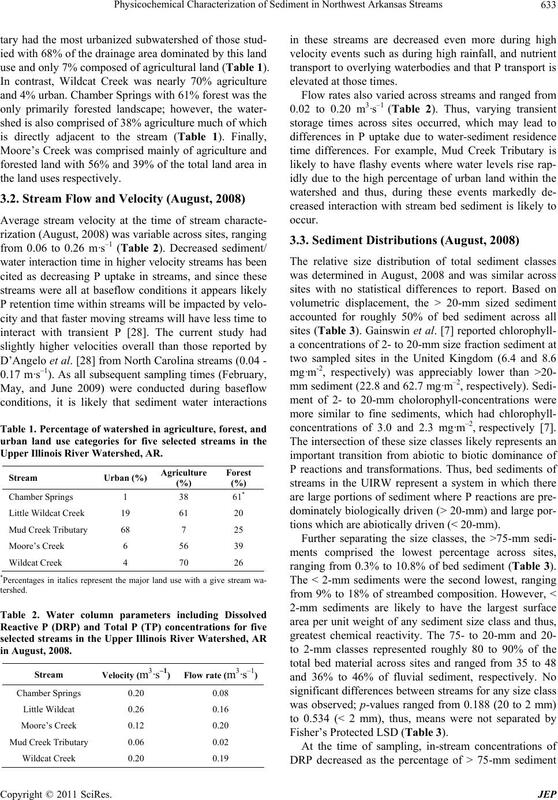 criteria in streams,” Trends in Ecology & Evolution, Vol. 22, No. 12, 2007, pp. 669-676.
mont,” Ecological Engineering, Vol. 18, No. 4, 2002, pp. 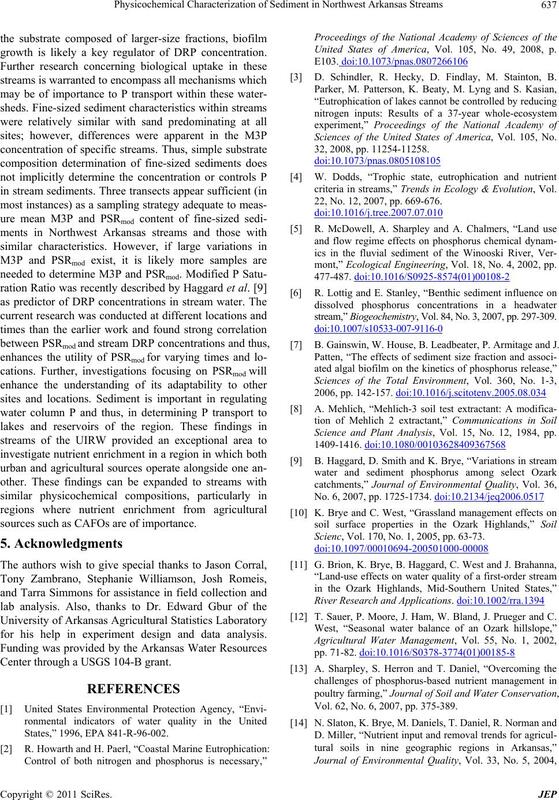 stream,” Biogeochemistry, Vol. 84, No. 3, 2007, p p. 297-309 . B. Gainswin, W. House, B. Leadbeater, P. Armitage and J.
Scienc, Vol. 170, No. 1, 2005, pp. 63-73. T. Sauer, P. Moore, J. Ham, W. Bland, J. Prueger and C.
Vol. 62, No. 6, 2007, pp. 375-389. Engineering, Vol. 26, No. 4, 2006, pp. 375-391. Vol. 38, No. 5, 2009, pp. 1989-1997.
kansas Land Use and Land Cover,” 2006. 20th Edition, Washington, DC, 1998. Environmental Studies, Vol. 27, No. 3-4, 1986, pp. Research, Vol. 1, No. 1, 1995, pp. 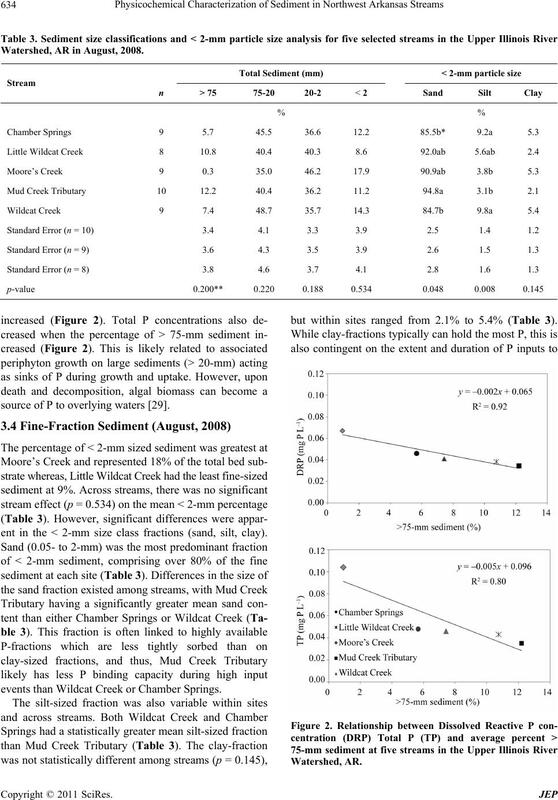 7-9.
for Monitoring Soil Quality,” In: J. W. Doran and A. J.
ence Society of America, Madison, 1996, pp. 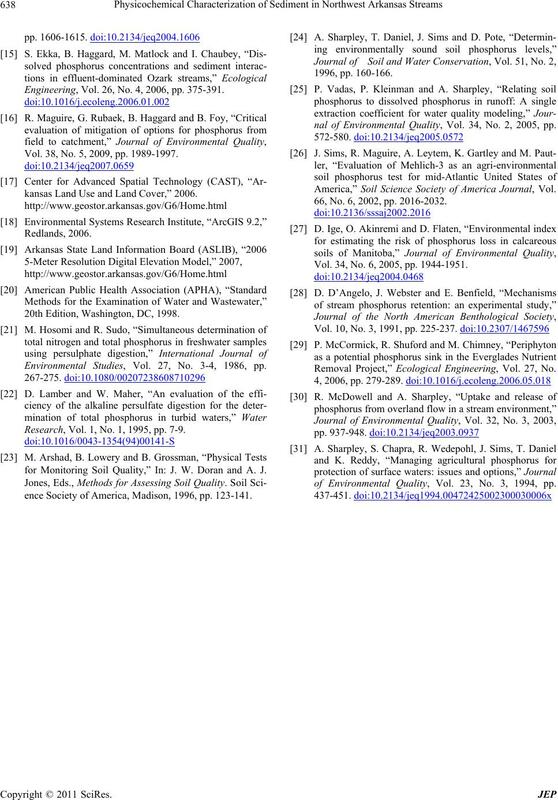 123-141.
nal of Environmental Quality, Vol. 34, No. 2, 2005, pp. 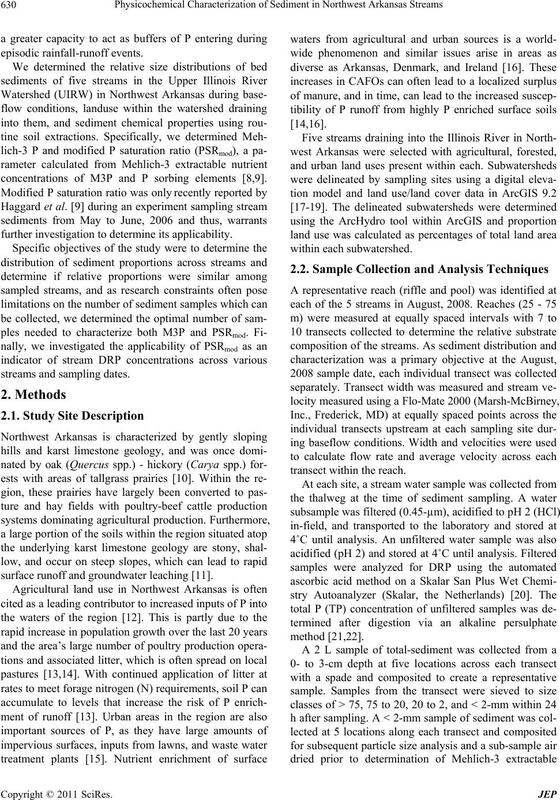 America,” Soil Science Society of America Journal, Vol. 66, No. 6, 2002, pp. 2016-2032. Vol. 34, No. 6, 2005, pp. 1944-1951. Removal Project,” Ecological Engineering, Vol. 27, No. of Environmental Quality, Vol. 23, No. 3, 1994, pp.